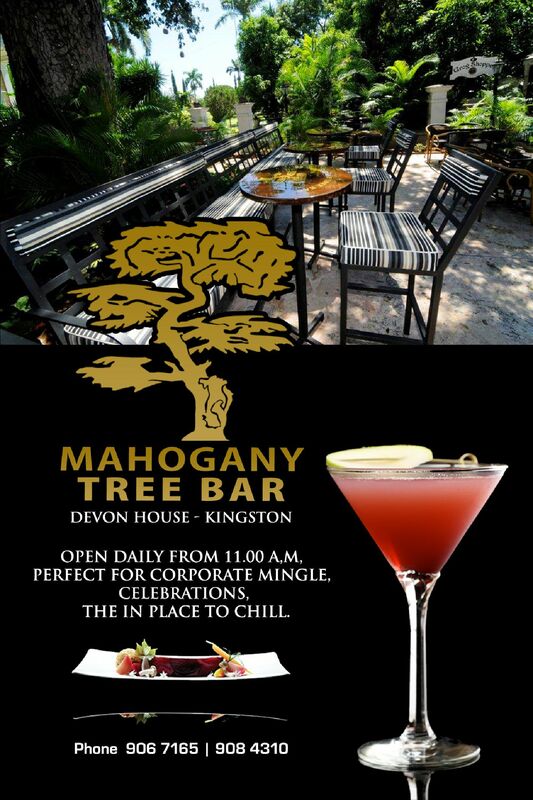 The beautiful Mahogany Tree bar, surrounded by the lush, tropical greenery of Devon Hous is located directly across from The Grog Shoppe at Devon House. The picturesque bar with its beautiful garden lights and the night skies amid the greenery provided a beautiful backdrop to the perfect location which is ideal for anniversaries, birthdays, business meetings, and much more. the in place to chill. One of the very few open air bars in Jamaica, Mahogany is the ideal place to spend an evening by yourself or with friends enjoying a drink and finger food. The bar now offers some authentic, mouth-watering Jamaican finger food, such as delectable pickled salt fish served with crackers, stamp and go, fried sprats as well as a wide variety of sandwiches, hamburgers, pies and soups. But if you are looking for something heavier, you can always order from the nearby Grog Shoppe restaurant. The revamped bar will now boast live performances every Friday and Saturdayy night. The bar which will be opened from Mon - Sat: 11:00 a.m. to midnight, or until the last guest leaves, will be closed on Sunday except for special functions. And as with all bars, they offer a wide variety of cocktails and drinks served by a team of professional bartenders who are quick and willing to serve up any mix to suit your needs. The Bob, made with red syrup, myer's rum, orange juice, crème de menthe and cointreau.